This 12" x 18" massage therapy poster addresses an important healthcare philosophy principle with your patients. 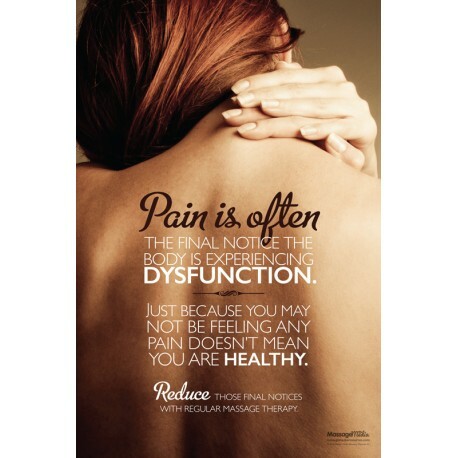 Use this poster to help them become aware that tissue dysfunction happens before pain, meaning preventative maintenance should be a priority! Poster text reads: "Pain is often the final notice the body is experiencing dysfunction. Just because you may not be feeling any pain doesn't mean you are healthy. Reduce those final notices with regular massage therapy".